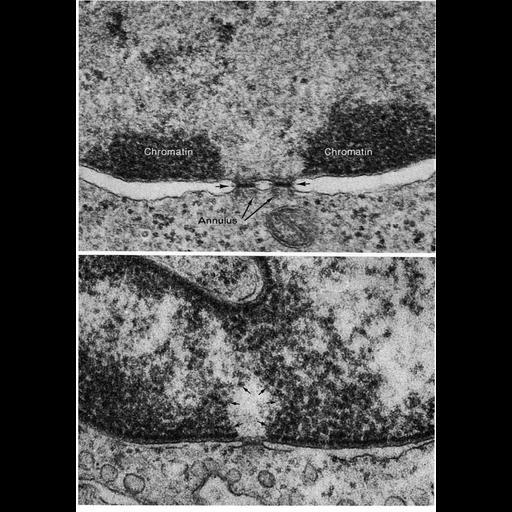 Transmission electron micrographs showing details of nuclear pores in thin sections of an erythroblast (above) and endothelial cell (below). Pores appear to be filled with dark staining material in these thin sections. Accumulations of heterochromatin at the nuclear envelope are excluded from pore-containing regions. Figures 146 and 147 from Chapter 4 (Nucleus) of 'The Cell' by Don W. Fawcett M.D.